Replaces traditional fastening by compound or with screws in many cases, as it is a simpler, faster, quieter, cleaner and cheaper solution. 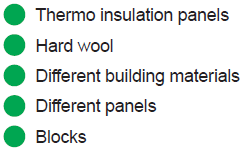 Adhesive foam has good thermal insulation characteristics and noise barrier. Very good gluing and sealing properties. Excellent adhesion to various materials, such as polystyrene, plaster, wood, concrete, stone, metal and PVC, as well as mineral substrates. Very economical, saving time and money. Uniformly strong structure and sufficient elasticity. Very little post-expansion and expansion pressure allows fast and accurate gluing. High-quality results in various weather conditions. Can be used with a foam gun or the supplied EasyGun applicator. Fixing of insulating boards to facades and basements. Fixing of interior finishing tiles to walls. Sealing of narrow spaces between the insulation or building boards.